When people say, "Oh, you crazy kids!" these are the Kids they mean, the original Crazy Kids. 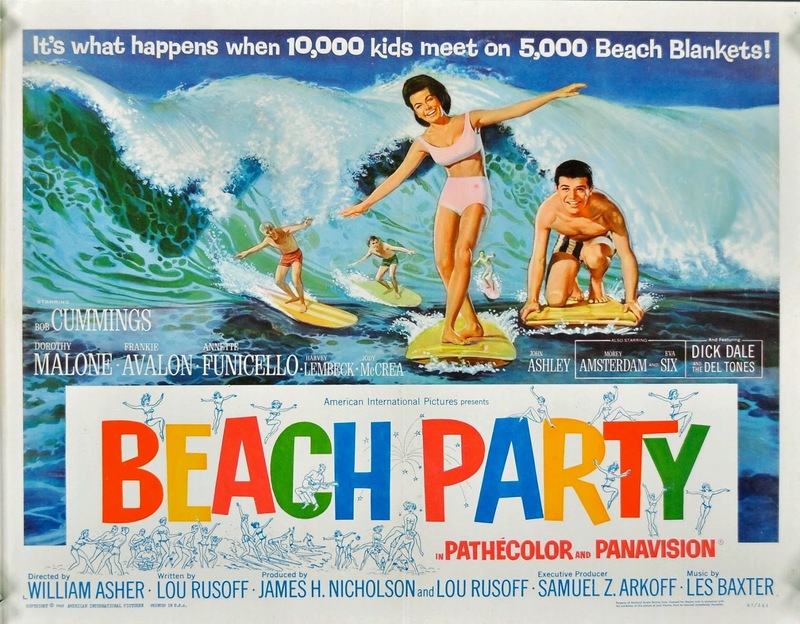 Beach Party is a light hearted romp filmed in 1962, and aimed at the then-newest emerging market- the American Teen. Annette Funicello and Frankie Avalon star as Delores and Frankie, two teens in love. When Delores gets cold feet about staying at a beach house alone with her boyfriend, she invites the whole gang along- much to Frankie's surprise! She wants him to think of her as more than "just a girl," but "as a wife!" Meanwhile, as he puts it, he's on the hook because he loves her, but no boy wants to let that secret out, so, he plans to make her jealous using a cream puff of a waitress. But the tables turn when Delores becomes interested in an older man. Adding to this mix of zany, it turns out this is no ordinary fellow, but an anthropologist interested in studying the South Californian teens as if they were some other culture or tribe (which, let's face it, they might have been to many adults in those days). It's a game of who's fooling who- and that's not even counting getting the local motorcycle gang or a bunch of rock 'n' roll hits into the mix! What will these crazy kids do next?! The plot is paper thin and relies on campiness to see it through, but it is still a delightful summertime romp for all that. As the screen writer put it, it was meant to be "good, clean fun!" Nobody expected that the good, clean fun of this B movie would be a smash box office hit! It spawned an entire sub-genre of the 1960s film industry- the Beach Movie. American International Productions, the studio that produced Beach Party, went on to make make seven more films using the same basic characters, cast, plot, and beach-and-bikinis formula. But perhaps they shouldn't have been so surprised by it being a hit. Unusually for a B film, this movie featured only songs made especially for it (mostly in that Beach Boys style. In fact, the Beach Boys- and many more musicians- would have cameo bits in later films). Their pick for lead actress had always been wholesome rising-star Annette Funicello, who was sure to be a box office draw as well. She'd made her debut as one of the original Mouseketeers with Disney, and Walt had cultivated her career with other starring roles and even recording contracts. He could be overprotective at times (Funicello had been a personal "discovery" of his); he'd needed script approval in order for the film to get her, and assurances that Funicello would not be dressed in a way to ruin that wholesome image. Poor Delores then is mostly clad in suspiciously high-necked attire for a summer time setting, but she does at least get a (high waisted) bikini! Teen idol, Frankie Avalon, starred opposite of her; thanks to the Beach films he would have a decade long career at API of playing teens though he was already in his twenties for this first beach film. Though not in a starring role, Harvey Lemback's career would also be substantially impacted by his role in the film. Playing inept bike gang leader Von Zipper as a parody of Brando in The Wild Ones, he would revive the part again and again as the villain of almost all the sequels. When starting, the opening song falls rather flat. Power through it though, because what comes after makes it worth it. We aren't watching for the story. We're watching for the rest of the music, for the colorful 60s beach aesthetic, and for the cheap laughs and physical prat falls that you can't help but love. It will make you want to grab your own surf board, hop in the car, and head to the nearest Beach Party. Dig it! I adore Beach Party movies! They are so kookey... ha ha! Get it? Love the style and how their hair never gets wet when they are surfing. You can totally watch this on Netflix. I just couldn't figure out how to link, so I linked to amazon's insta-play thing instead. What We Wore: To Our High School Reunion!